If for some reasons a friend or friends cannot be found in the game, it's necessary to check the adjustments. A. If you cannot find some friends, check the list of blocked users. 1. Open Facebook in the browser. 2. Go to the Settings. 3. Open the "Blocking" section. 4. Make sure their names are not in the "Block Users". B. Moreover, you can check the list of friends in the settings. 1. Go to the "Apps" section in the Settings. 2. Edit Gambino Slots, clicking on the emerging pencil. 3. See if the "Friend list" is marked by a tick. C. The final action that can be undertaken is re-installing the game. 2. 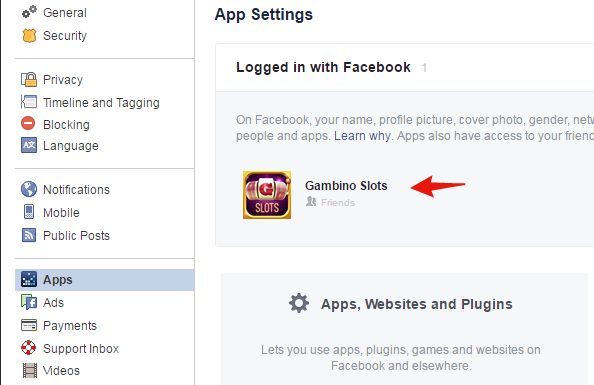 Delete Gambino Slots, clicking on the X symbol that will appear. 3. Then install the game again. How can I get the game to stop posting to my timeline? It is just too much clutter. Thank you!